As Kathryn and Chris stumble into polyamory, Next Year, For Suretracks the tumultuous, revelatory, and often very funny year that follows. When Chris’s romance with Emily grows beyond what anyone anticipated, both Chris and Kathryn are invited into Emily’s communal home, where Kathryn will discover new romantic possibilities of her own. In the confusions, passions, and upheavals of their new lives, both Kathryn and Chris will be forced to reconsider their past and what they thought they knew about love. Offering a luminous portrait of a relationship from two perspectives, Zoey L. Paterson has written an empathic, beautiful, and tremendously honest novel about a great love pushed to the edge. Deeply poignant and hugely entertaining, Next Year, For Sure shows us what lies at the mysterious heart of relationships, and what true openness and transformation require. Next Year for Sure is a story about a couple and the decision to start an open relationship. It follows Chris and Kathryn as they meet and grow a relationship with Emily, Chris' new crush. Maybe I'm a little too old fashioned and conservative when it comes to relationships, but this book was just really strange to me. I'm a one man kind of girl and I got the chills every time I imagined myself in a situation like Chris and Kathryn's. I tried to be very open minded with this book because I read the synopsis and knew what it was about. After reading the first few chapters, I knew it was going to be a little tough for me. Don't get me wrong, it was definitely interesting and made me think about how different people handle relationships, but it also made me very grateful that my husband doesn't want an open relationship! It was intriguing to me that even though I really didn't care for Chris, I still think he would be a fun person to be around, he just may not be the type of person you could ever settle down with. And same for Kathryn, She was an interesting character, but I really wanted her to be stronger than she was. 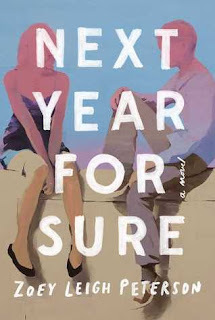 All in all, Next Year for Sure is an interesting read but it didn't really pull me in. I wanted to like it, but I think I'm just a little to old fashioned for the idea of an entire story about an open relationship. *Thank you Scribner for sending me Next Year for Sure in exchange for an honest review.